Hotel Brit Hotel Rennes Cesson - Le Floréal is equipped with 51 rooms including 25 double rooms, 25 twin rooms and 1 family room. 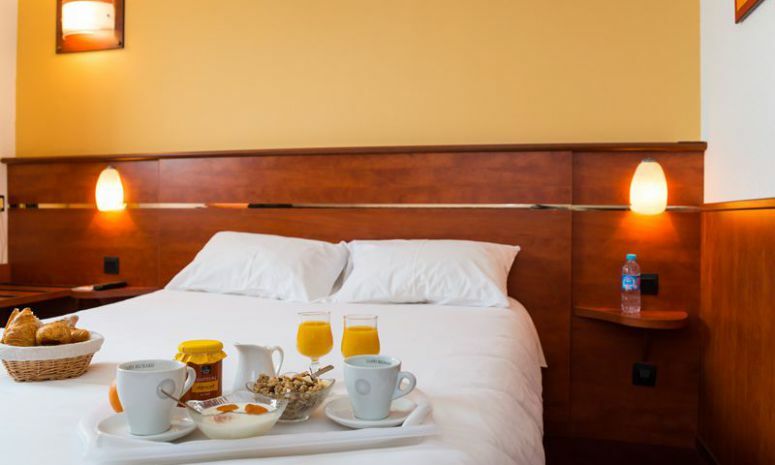 Relax... all rooms are soundproof and equipped with LCD flat screen TV, Canal+ and satellite channels. ...or use your room to work. Indeed, the rooms of the Brit Hotel Rennes Cesson - Le Floréal are equipped with Wi-Fi internet network and this for free! A direct dial telephone is also available in each hotel room. Finally, in each room, office furniture is installed to allow you to work in the best conditions. All rooms at the Brit Hotel Rennes Cesson are equipped with duvets. The twin beds are 140 cm in size while the double beds are 160 cm. The bathrooms have a shower, a sink, a hairdryer and toilets are integrated. The Brit Hotel perfectly suited my needs for this trip. I was in Rennes for meeting at the university and the hotel was very convenient to the Beaulieu site. The desk manager was friendly, helpful and welcoming. It's not a luxury resort, just a functional hotel for a night's rest. Highly recommend it if you're looking for a bed for the night with no frills.